Varicose veins can happen to anyone regardless of age or gender. According to the Society for Vascular Surgery, up to 40 million women and men in the United States are afflicted with varicose veins. As if their unsightly appearance is not enough, varicose veins can cause significant pain and indicate the presence of more serious vein issues. While you can't stop varicose veins from developing, you can take proactive treatment steps. Endovenous Laser Treatment, or EVLT, is an innovative new laser treatment that gets rid of bulging, twisted varicose veins with a minimally-invasive, FDA-approved procedure. EVLT treatments at our Birmingham, Alabama cosmetic surgery center are used to dry up varicose veins with a thin fiber that is inserted into the veins. Laser energy is transmitted into the vein walls, causing them to collapse and diverting blood flow to nearby healthy veins. With EVLT at Hedden & Gunn Plastic Surgery, you can have the freedom to show off your legs in short and skirts again. Varicose veins are the bulging veins that appear above the surface of the skin. They may be blue or dark purple in color. Because of the increased pressure on lower body veins caused by standing and walking, varicose veins are usually found on the back of the calves or on the inside of the legs. Risk factors include genetic disposition, the normal process of aging, occupations that require prolonged standing, being overweight and pregnancy. Though their unsightly nature can make anyone feel self-conscious, cosmetic concerns are just one aspect of living with varicose veins. People with varicose veins can experience heavy, tired and aching legs in addition to cramping, burning and throbbing in the lower legs. Left untreated, varicose veins can increase your risk of more serious circulatory disorders. Varicose veins are a symptom of Chronic Venous Insufficiency (CVI), a long-term condition usually caused by malfunctioning vein valves. When these valves malfunction, blood pools in the veins and pressure builds up. This process weakens the vein walls and causes them to bulge. This increased pressure can cause additional vein valves to fail over time. It is important to address vein issues as early as possible before further damage can occur. 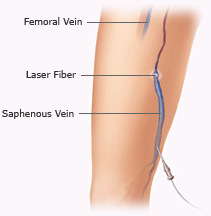 The VenaCure Endovenous Laser Treatment for varicose veins is performing using a thin laser fiber that directs energy to the inside of faulty veins. These precise doses of laser energy cause the walls of varicose veins to collapse, closing the veins and preventing further blood pooling. Veins treated with EVLT are absorbed by the body, while blood flow is sustained by healthy veins. With a success rate as high as 98%, EVLT procedures are performed using local anesthesia and usually take less than an hour. Most patients can immediately return to their normal activities with almost no pain. Birmingham, Alabama EVLT procedures at Hedden & Gunn Plastic Surgery improve the appearance of varicose veins on the surface of the skin with minimal or no scarring. Endovenous laser treatment is often covered by health insurance when patients experience pain, swelling, leg cramps, ulcers, bleeding and the presence of venous reflux on an ultrasound scan. Most carriers require 3 to 6 months of conservative therapy prior to providing coverage. This therapy may include compression, elevating the legs and losing weight. Check with your insurance company to determine which treatment options are covered under your plan. Remember life before varicose veins? You can have that freedom again with the EVLT Varicose Vein Laser. If you are looking for freedom from varicose veins with the EVLT laser procedure, please contact our cosmetic surgeons in Birmingham, Alabama today.